Don’t let the corral of horses fool you or the Western-style lodge, with its high-vaulted ceilings and huge circular fireplace. This is not Texas...or Montana. This is authentic Northern Michigan—195 lush, rolling acres of it—and it’s all yours to enjoy. “If you love horses, you’ve come to the right place,” explains General Manager of Ranch Rudolf, Melody Hamill. “We have 35 horses and all the fun that goes along with them”. Ranch Rudolf offers a wide variety of horse-related activities, including trail rides, children's horse camps, hay rides, sleigh rides, and more. 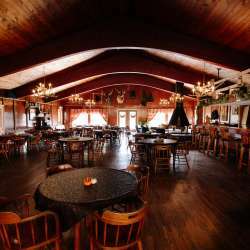 Ranch Rudolf is one of Traverse City’s original landmarks, dating back to the early 1900’s. It was named after Rudolf Paziener, the property’s caretaker who arrived here in 1922. At the time, the property consisted of two homes and fishing lodges, which were rented out weekly. 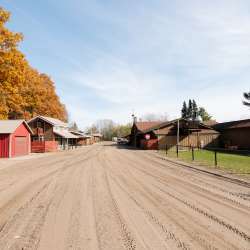 Today, Ranch Rudolf is the #1 guest ranch in Northern Michigan, offering a wide array of outdoor activities. Guests can enjoy horseback riding through the Pere Marquette State Forest, as well as kayaking and tubing the Boardman River, which flows through the property. Anglers can test their skills on one of the ranch’s stocked trout ponds. In the winter, guests have easy access to the vast network of cross-country and snowmobile trails. The ranch offers a variety of lodging options, depending on how close to nature you want to be. The campground accommodates both tents and RVs and each site includes a fire pit, picnic table, and water and electric hook-up. 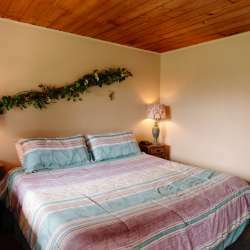 The ranch also offers 16 motel rooms, which sleep two to four people. (Some are pet-friendly and only some have air conditioning, so inquire ahead of time.) There’s also a two-story bunkhouse that sleeps up to nine and features a full kitchen and bathroom. There are even accommodations (during the summer only) for campers who bring their own horse. As for dining, the ranch operates as a guest ranch during the summer, providing meals to overnight guests only. During the winter, the ranch has dining for guests and non-guests alike who order off a menu.